Question the money. But don’t waste it. On campus these days, it’s hard not to notice the grandiose energy that Dartmouth’s 250th anniversary has ignited. The festivities launched on Jan. 10 with speeches by College President Phil Hanlon and the 250th co-chairs, vice president for alumni relations Cheryl Bascomb ’82 and English professor Donald Pease, in the lobby of Baker Library. A new initiative, the Call to Serve, was announced, setting a goal for the Dartmouth community to achieve 250,000 hours of community service by the end of the year. In the spirit of the liberal arts, eight new courses and 20 symposia have been created to foster reflection amongst the community on Dartmouth’s past and future. Exhibitions, projects and performances under this same theme abound for the rest of the year. And very soon, the long-awaited opening of the newly renovated Hood Museum of Art will bring in a year of special programming and exhibits to continue the celebration. All this intellectual and creative flourishing designed to honor Dartmouth’s legacy is not without at least some degree of pomp and circumstance. Greenlighting Day on Jan. 12 sent flashy signals as landmarks in major cities ’round the girdled earth were illuminated in green. Celebrations across the country will bring alumni together for champagne, hors d’oeuvres and nostalgic speeches — all artfully designed to seduce donations out of the pockets of alumni looking back on their Dartmouth experiences with rose-colored glasses. This will be a year full of meaningful reflection and celebrations of pride, but it will also be a year full of seemingly meaningless and ostentatious displays of wealth. Don’t be fooled, though — these grandiose gestures and the many, many glasses of champagne that Dartmouth will be serving to generous alumni mean more than they seem. These gestures bring alumni back to their college days to remind them of all that Dartmouth has done for them; they remind them of how proud they are of their alma mater; and ultimately, they encourage them to make generous donations to an institution they feel indebted to. All this grandiosity is targeted and purposely meant to catalyze the generosity that will give back to Dartmouth’s present and future students. Giving alumni reason to be proud of their alma mater is especially important right now. The $70 million federal class action against the College came at a pivotal moment, creating a public dialogue on just how deeply entrenched sexual assault is at Dartmouth — moments before its 250th anniversary. Many alumni are angry and unwilling to give to an institution that has allowed such injustices to occur. It’s clear that damage control is underway and that the celebrations will be playing a big role in detracting everyone’s attention elsewhere. This leads to the question of whether it is Dartmouth’s reputation or sense of community that drives alumni donations — and both seem to be at play. Dartmouth is not alone in this attitude of pleasing wealthy alumni for the sake of driving in donations — it’s how American higher education tends to function. Lighting up major landmarks across the country and world does nothing for a Dartmouth education, but does everything for the alumni community in New York City when they see the Empire State Building light up green, just for them. There is much to be said about the level of extravagance necessary for many members of the Dartmouth community to unite behind their alma mater. 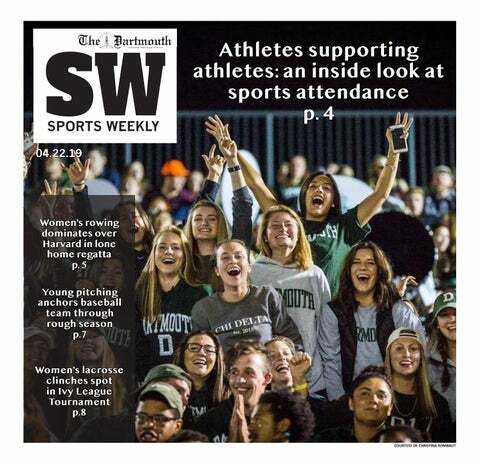 By investing so much in its brand image in ways that do not directly add to the value of a Dartmouth education, the College inherently nourishes a culture wherein alumni and students exalt the level of wealth and prestige associated with the College instead of the experience fostered on this campus. If Dartmouth were to remain exactly as it is — offering the same education and the same opportunities — and the only changes were its U.S. News ranking or the budget allocated to its New York or D.C alumni groups, it’s plausible to assume that far fewer alumni would want to send their children here. This kind of emphasis and set of priorities should not be encouraged — but the financial support offered by alumni sustains the Dartmouth education students experience today. This year in particular, students ought not to let this spending go to waste. While being cognizant of the incentives behind Dartmouth alumni’s donations and acknowledging Dartmouth’s flaws, students still have a responsibility to learn, engage with this community and take away as much as they can from their time here. The toxic environment highlighted by the recent lawsuit left many members of this community upset and disappointed, and it shed light on just how much needs to change for Dartmouth to become a safe and inclusive environment for everyone the College welcomes onto its campus. And there are plenty more reasons to condemn Dartmouth as an institution, but think carefully before boycotting the College’s offerings or refusing to engage — it does relatively less to send a message to its administration and more to potentially hurt students for whom a Dartmouth education would not be possible without alumni support. As the College celebrates its 250th anniversary, exhibitions, lectures, performances and new courses give students the opportunity to deepen their understanding of the College, their roles here and how they can utilize their experiences and education to create a better and more forward-thinking Dartmouth.